Tata tea museum is located in Munnar in Idukki district which is very famous for its tea plantations. The tea museum concentrates on the aspects such as the evolution and growth of tea plantations in this area. 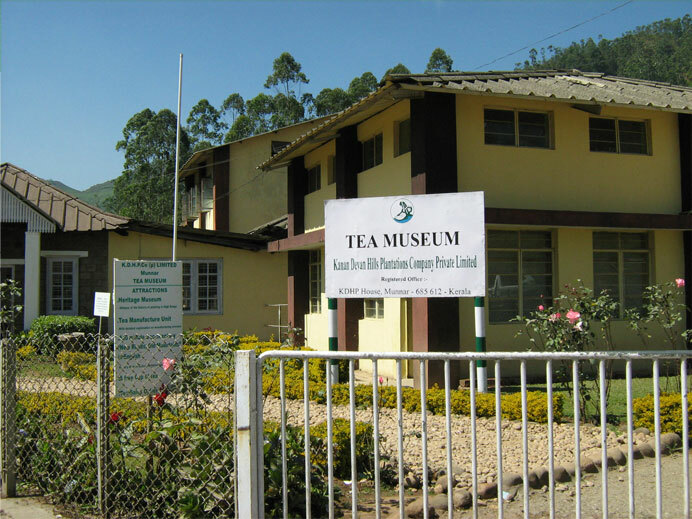 This museum is opened by the Tata tea and was started in the year 2004. It lies at the Nallathanni Estate of Tata Tea. There are many photographs, curios and machinery that have been used since olden times displayed here. All these depict the evolution in the field of tea plantation. Stages in tea processing can also be understood from here. Some of the unique display items include the original tea roller called as ‘Rotorvane’ of the year 1905, rail engine wheel of Kundale Valley Light Railway that was used to transport both men and goods from Munnar to the hill top, ‘Pelton Wheel’ which was used to generate power etc. There is another section in which wooden bathtubs, bungalow furniture, iron ovens, magneto phone etc of the olden times are kept. This museum is set up as a tribute to those who have struggled a lot to transform Munnar into a major tea production centre. A sundial that dates back to 1913 is kept in this museum. This was made by the Art Industrial School at Nazareth, Tamil Nadu and is placed on a granite block. There is a demonstration room where one can taste the tea that is produced here. There will be a wide variety of tea and the visitors here get a chance to taste them.